Gun-rights haters will do anything at all to remove guns from the hands of their fellow Americans. So far 22,000 gun laws and efforts to bring us 22,000 more have not made these folks happy. Their new focus was to take tax money needed for healthcare and schools and simply give it away. 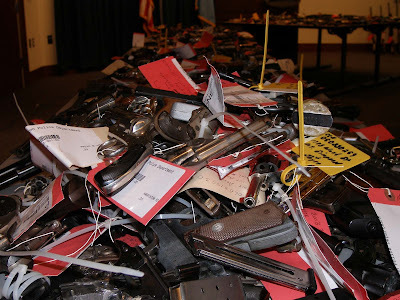 The Chicago program was quite simple, A, “No questions asked” gun buy back. They advertised to bring in any gun whether real or not and leave with a pre-paid MasterCard worth $100.00. There are millions of guns out there that did not cost more than $10.00 to manufacture. The cheap firearms filled the market need for affordable self-defense for the desperately frugal or just plain poor folks. Most often these low-end guns get equally low-end care having never been cleaned or oiled. After a few decades of total neglect and abuse these guns are nearly worthless, except in Chicago. Why keep broken, unserviceable junk lying around when you can turn them into better firearms, accessories and ammunition? Burglars and thieves need not take stolen firearms to an underworld fence when the City of Chicago is paying top money for hot items. This silly government plan encourages theft, burglary and robbery. Of course someone will get killed along the way during a crime manufactured by this insane government program. The group called, Illinois carry posted the exploits of a fellow known as “john” to cash in on this mindless Chicago giveaway. This chronicles the experience of a gun profiteer as he exploited the taxpayers of the Windy City. You can read John’s first hand account here. Police blotter . . .
Sneed hears former Police Supt. Phil Cline, who now serves as executive director of the Chicago Police Memorial Foundation, added a new way to help families of cops killed in the line of duty. • • Translation: At a candlelight vigil planned next month to mark the first anniversary of the Police Memorial Park behind Soldier Field, Cline will announce the foundation will now provide college scholarships. Bravo. Cline is beyond belief in his shamelessness and egotism,anything to promote himself and capture press. Horrendously,this is all done on the graves of our dead heroes. I refuse to donate one penny more to this charade or to attend any event which Phat Phil is present at. I can not in good conscious support this abuse and pay Cline to do this. Any officer with a heart should reject this outrage. Stupid Liberals making crime problems worse through such a wasteful scheme. Don't you know that is how we get all our drop guns that we plant, after we kill innocent black males running from us? At least that was the espoused theory(idiocy) of a Westside Reverend after a recent police shooting. A Compromise Verdict For Phil Spector? Holy Cow! 90 Guns Per 100 People! Illumination Hit The Hollywood Virgin Megastore!